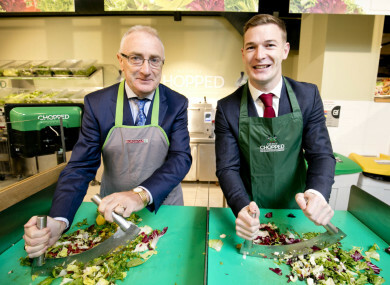 IRISH SALAD BAR chain Freshly Chopped has plans to sell a range of branded merchandise from its Grafton Street outlet in order to make peace with Dublin council over a planning row. The company’s Grafton Street outlet was opened in February 2016 in a unit that is currently zoned for retail use and was previously occupied by Maguires newsagents – which included a small deli offering. However last year Freshly Chopped was told by local and national planning authorities its outlet was in breach of planning regulations and the company did not have permission to trade from the city centre location. The council was concerned that the salad bar would seriously injure and detract from the retail character of the area. Speaking to Fora recently, Freshly Chopped founder Brian Lee said the company had been in discussions with the council and received advice that changing the signage and adding a retail element to the store could resolve the planning issue. In a planning application last year, Freshly Chopped outlined in planning documents that it would turn three-fifths of the outlet into a retail store – with just over a tenth of the 41 sq m shop retained as a salad bar – and redesign the shopfront. The company said it would sell a range of Freshly Chopped-branded tea towels, aprons, chopping boards, reusable coffee cups and tote bags. It also plans to stock knife sets, Irish cookbooks and mezzaluna chopping knives. Hughes Planning and Development Consultants, acting on behalf of Freshly Chopped, argued that this would bring the salad chain’s Grafton Street store within the parameters of planning regulations. The consultants said that salad sold from the unit would be consumed off premises and since the sale of food is subsidiary to the main retail use, the unit could be defined as a ‘shop’. In response to the concessions made by Freshly Chopped, Dublin council said it still has “concerns” that retail space is still not a large enough proportion of the unit. The council added that some more amendments also need to be made to the shopfront to bring the unit within retail guidelines. A spokesman for Freshly Chopped said the company has lodged new plans with the council in a bid to keep the Grafton Street outlet open. Fora understands the food chain will whittle down the food element further if needed in order to meet planning requirements. A final decision on the dispute will be made by the council in the coming months. Freshly Chopped, which was co-founded by Brian Lee and Andy Chen, has rapidly expanded since it first launched in 2012. The majority of its stores are based in Ireland, but the brand has also opened two stores in Cyprus. The firm opened its 60th outlet as part of an expansion into the UK market. Freshly Chopped and the local council first locked horns in relation to the Grafton Street unit in 2016 when requests to retain modifications made to the Freshly Chopped outlet were knocked back. During an unsuccessful bid to overturn the council’s decisions on the matter with An Bord Pleanála, Freshly Chopped said if the store was closed “it could damage the company so much that it will jeopardise the brand entirely along with over 600 jobs”. The council can issue enforcement notices and pursue legal action in order to force through the closure of a business that is in breach of planning policy. Discount retailer Dealz and coffee chain Starbucks were subject of legal proceeding by Limerick and Cork councils respectively in recent years after the two firms were found to be in breach of planning laws. Email “Freshly Chopped plans to sell hats, knives and tea towels to keep its Grafton Street outlet alive”. Feedback on “Freshly Chopped plans to sell hats, knives and tea towels to keep its Grafton Street outlet alive”.